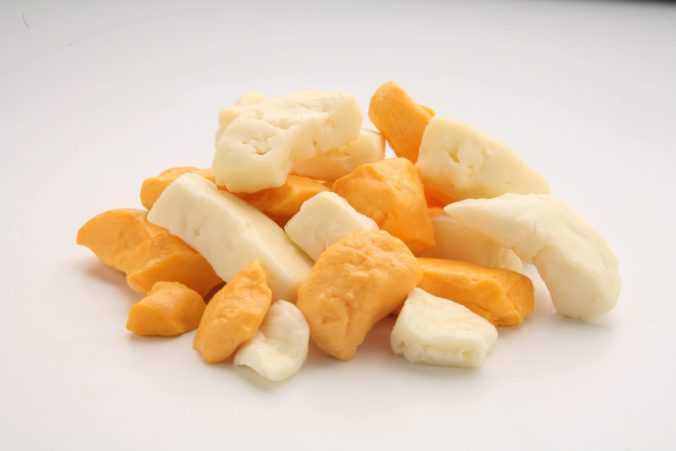 Easily browse all Wisconsin Cheese products available for online ordering from Leroy Meats & Catering. This cheddar has been aged 2 years and has a firm texture and a sharp, clean tanginess that is contrasted by undertones of nutty sweetness. Serve at room temperature for the best flavor and texture. 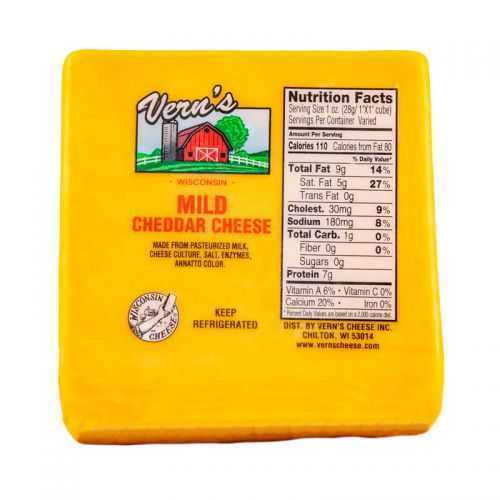 This cheddar has been aged 5 years and has a firm and drier texture than young cheddars. Cow's milk is used while preparing the cheese. 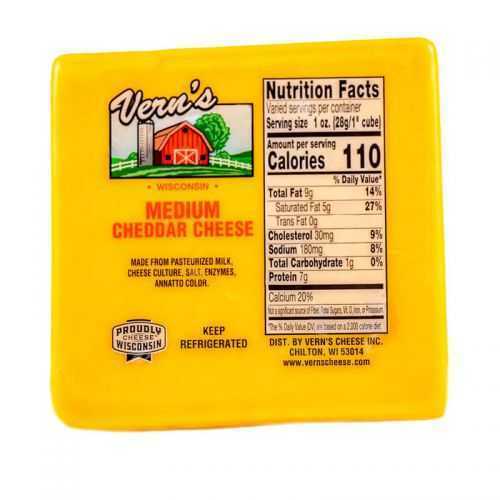 The cheese has powerful smell, mild taste and tastes best when ripen for seven months in highly humid conditions. 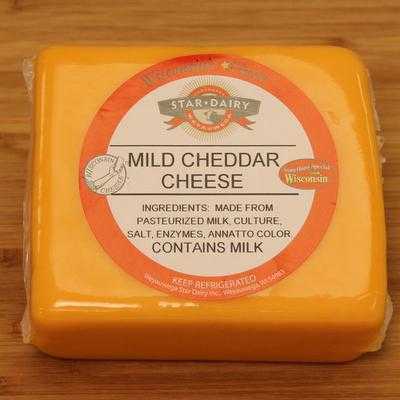 A flavorful mild cheddar that has a creamy texture and hint of that classic cheddar tang. Easy to slice, shred and melt. 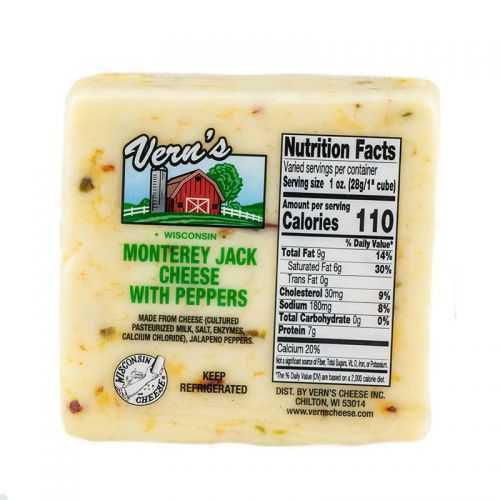 Our Pepper Jack Cheese is a blend of Monterey Jack and pepper flakes. A perfect sweet and spicy combo that finishes with a balance of heat and tanginess. 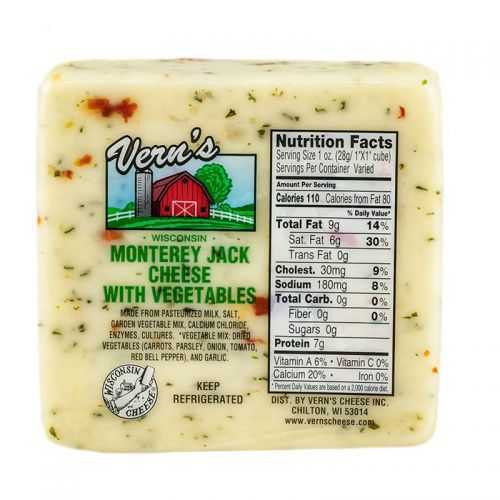 Our Vegetable Jack Cheese is a blend of Monterey Jack and garden vegetables that has a fresh, sweet flavor. We love to slice it and serve with whole-grain crackers! 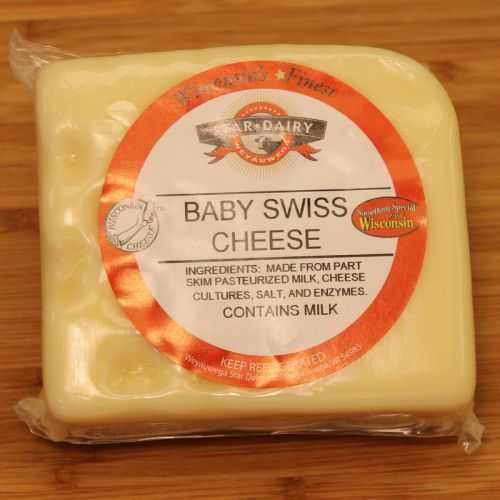 Baby Swiss is an American type of cheese that was invented by Alfred Guggisberg and named by his wife in the mid 1960s outside of Charm, Ohio. The reason why it is called 'Baby Swiss' is because it looks like a miniature version of Swiss cheese. 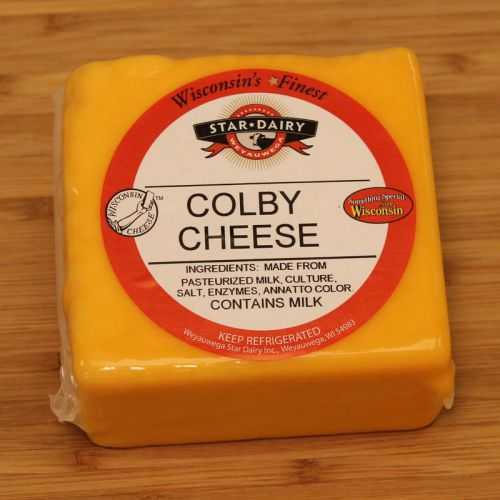 Colby cheese, originally called Colby Swiss Cheddar is a semi-hard American cheese prepared from cow’s milk. 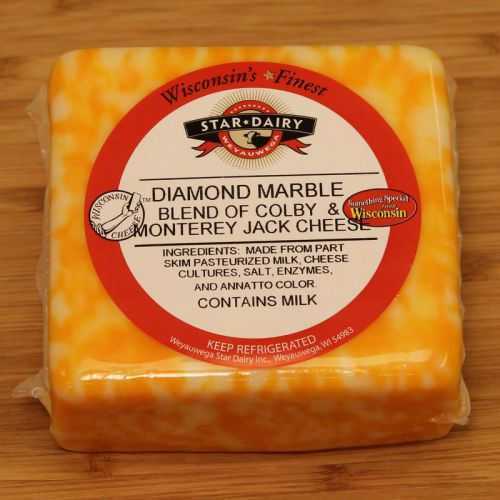 Diamond Marble (Colby Jack or Cojack) is a classic American combination of Colby and Monterey Jack cheese. 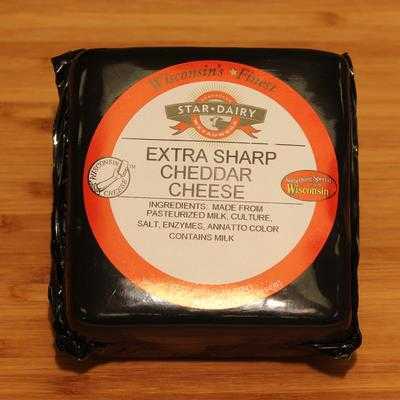 Weyauwega Star Dairy Extra Sharp Cheddar - This cheddar has been aged over 2 years. 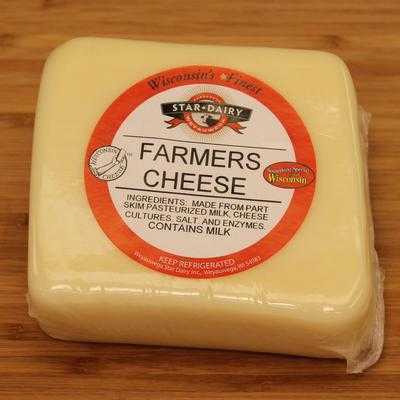 Weyauwega Star Dairy Farmers Cheese has a mild taste and is not aged more than 2 months. It is great for sandwiches and snacking. 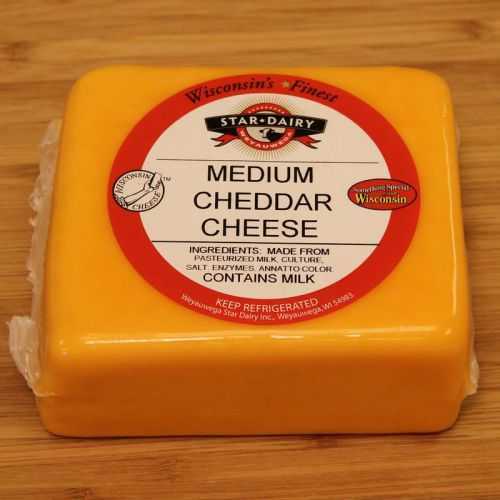 Weyauwega Star Dairy Medium Cheddar has a slightly stronger flavor than the mild cheddar. 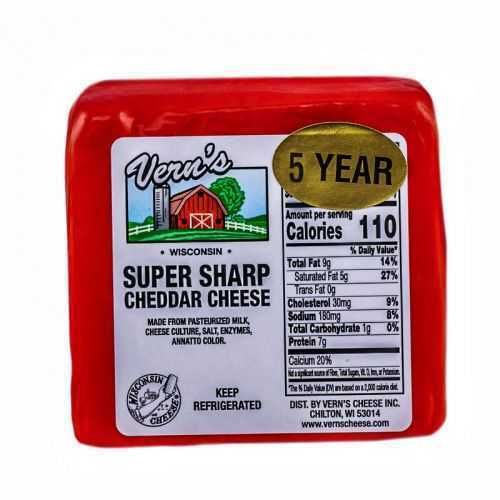 This cheddar is aged up to 9 months. Some Brick cheeses resemble Germany’s surface-ripened Beer Cheese or Beer Käse. 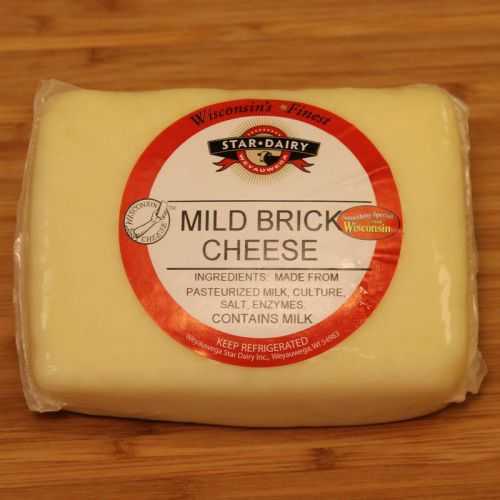 Brick was named for its shape and because cheesemakers originally used bricks to press the moisture from the cheese. 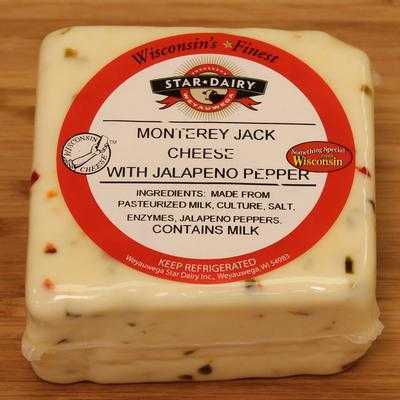 Weyauwega Star Dairy Mild Cheddar has a mild taste and is not aged more than 2 months. It is great for sandwiches and snacking. Like Mozzarella, Provolone is made by the Pasta Filata process. 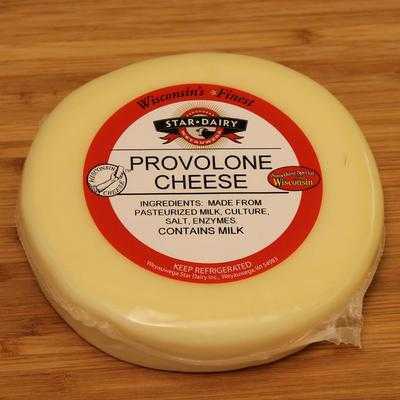 Slightly piquant when young with a firm texture that becomes granular with age, Provolone is made with different cultures, resulting in a fuller, more assertive flavor than Mozzarella. 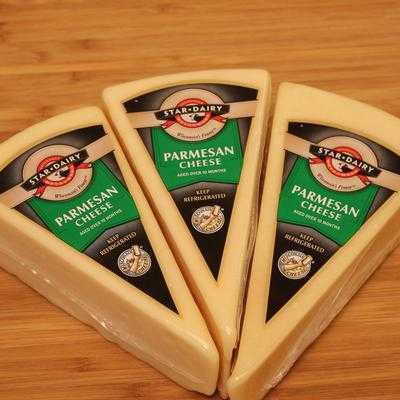 Weyauwega Star Dairy Parmesan Wedge - Known as the king of Italian cheeses, Parmesan originated in the Reggio and Parma regions of Italy. Made from part-skim milk and aged over 10 months. 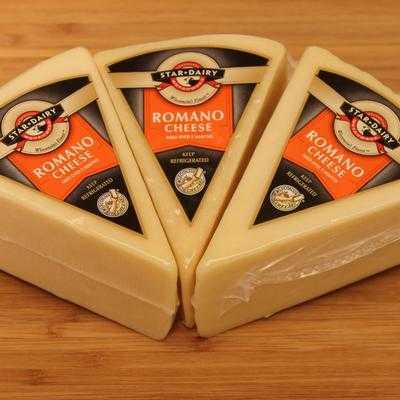 Weyauwega Star Dairy Romano Wedge - Wisconsin cheesemakers make Romano with cow milk and produce a cheese that, like its Italian counterpart, has slightly more fat and a flavor that is sharp, tangy and more assertive than Parmesan.